Resistance bands are used for a variety of different exercises, and some exercise programs even focus on exercises using resistance bands. When you don’t want to use weights or you don’t have access to them, resistance bands might be a good option so that your muscles are worked harder. Doing bodyweight exercises will help you get stronger, but there will be a time when you’ll need to add resistance so that you can reach optimal fitness. Resistance bands are a great first step in adding that resistance, especially if you’ve had some injuries and need to move slowly as you heal. 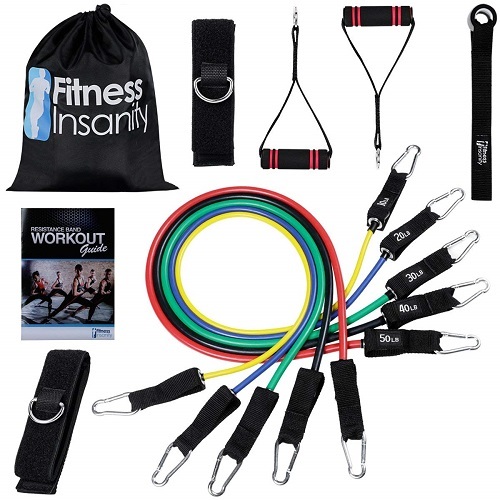 The Fitness Insanity Resistance Band Set is a great value. It includes 5 different strengths of resistance bands and plenty of other goodies to help you get in shape. Below you’ll learn about the Fitness Insanity Resistance Band Set, what it includes, and why you should purchase this resistance band set. 4 Exercise guidebooks in ebook form: A Guide to Resistance Band Training, A Guide to Get Lean in No Time, The Ultimate Guide to Bodybuilding, and Isometric Training: Is it Really Worth it? Is the Fitness Insanity Resistance Band Set Worth Buying? Resistance bands are an excellent piece of fitness equipment for a home gym. They’re affordable, durable, and versatile. They’re also easy to travel with so you don’t have to skip your workouts when on vacation or a business trip. Even if you have an extensive home gym, resistance bands are a great addition so that you can add some variety to your fitness routine. The Fitness Insanity Resistance Band Set includes 5 different strengths of color code resistance that are clearly marked with the equivalent weight for the amount of resistance in each band. There are 10, 20, 30, 40, and 50 lbs strength resistance bands. You can move up in resistance as you get stronger, and you can also use two or more bands combined if you need to. In addition to the resistance bands, this resistance band set includes handles, ankle straps, and a door anchor so that you can perform a variety of different exercises for a full body workout. You will also receive 4 exercise guidebooks in ebook form to help you learn how to use your resistance bands properly. The first is “A Guide to Resistance Band Training”, which gives you an overview of using resistance bands. There’s a guide to help you lean out called “A Guide to Get Lean in No Time”. “The Ultimate Guide to Bodybuilding” will help you learn how to build your body into the form you want by teaching you about bodybuilding. The ebook called “Isometric Training: Is it Really Worth it?” is all about isometric training and it will answer the main questions you may have and help you figure out if it’s a good fit for your fitness goals. In addition to all of these features, this resistance band set also has a lifetime warranty from the manufacturer where you can get a replacement product or have your money returned if you’re not happy with your purchase. The Fitness Insanity Resistance Band Set is an excellent choice if you’re looking for resistance bands or if you’re just looking for another piece of fitness equipment. It includes a variety of strengths of resistance bands, handles, ankle straps, and a door anchor to ensure that you can use the bands in a variety of ways. Because of this, these resistance bands will help you get a full body workout and will help keep your workouts exciting. They’re a great purchase for a home gym and a great gift for someone interested in fitness.